Following the crude oil that spilled into parts of the Kolo Creek farmlands and rivers including ponds last month, over 50 aggrieved farmers from Otuasega community in Ogbia local council, have decried the damages the spill caused to their crops and appealed to Bayelsa state government to intervene. 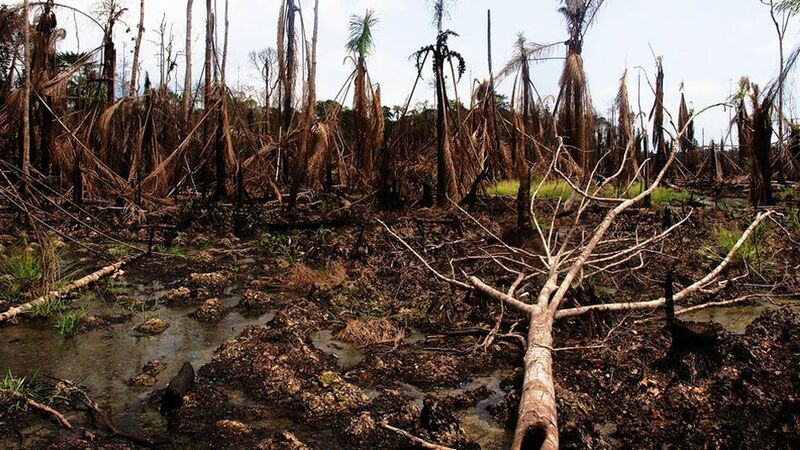 A leakage from Shell Petroleum Development Company (SPDC) facilities spilled crude oil on farms and rivers of Kolo communities and devastated their crops and economic trees. The aggrieved farmers said that a Joint Visit to probe the cause and impact of the spill excluded their farms despite efforts to draw the attention of the team to the impacted areas. The farmers comprising banana and plantain plantation owners and fish pond operators in the area appealed to the Bayelsa State government to assist them in prevailing on the oil firm to clean up the areas and compensate them for the losses. Mrs Florence Ako who owns a plantain farm opposite the Kolo Creek manifold said the crude oil which gushed from the manifold under high pressure spread into her farm and damaged her crops. “The damage caused by the oil on our farmlands is visible for all to see and this is happening so close to harvest time. Look at the fruits and the oil that spread on the fruits, the spill has condemned them, nobody can eat anything from them. Ako said, “It is this farm that me and my husband depend on to feed and train our children in the school and my husband’s farm was equally impacted at the other side. Unfortunately the Joint Investigative Team that visited did not come to this side and we came around to show them our farms but they did not listen to us and eventually they left. “So as we speak the officials that assessed the spill impacted areas excluded our farmlands and they have abandoned the oil residues and there is no oil recovery and clean up going on here,” Ako said. Mrs Ako’s husband, Olei Ako confirmed that though his own plantations were affected they were not captured by the investigation team. He said that the affected farmers had reported their plight to the Bayelsa State Ministry of Environment to ensure that their farmlands were cleaned up and remediated. Also embittered by the effects of the oil spill, Mr Badigigha Igbodo said his family-owned fish pond and several others were contaminated by the crude oil spill which wiped out the fish stock and left the ponds floating with dead fishes. Igbodo said that the spill had destroyed the means of economic sustenance of more than 50 farmers who are still counting their losses following the spill. The farmer maintained that the affected farmers believe that the spill was traceable to operational failure on the part of the oil firm due to a lapse created by the surveillance staff guarding the facility. Hear him, “We are told that Shell said the spill was caused by sabotage but it is rather their negligence because the facility is a well secured area and they should take responsibility for the security lapse that allowed this to happen. “This was the view of the community’s representatives but Shell officials imposed their own views and came out with the report excluding our farms,” Igbodo said. Reacting to the issue, Commissioner for Environment, Bayelsa state, Mr. Inuiro Wills said that the state government would verify the reported exclusion of impacted sites. “We have to look at the information and verify it and if it is true that the impacted area was larger than what was originally captured, we shall find a way of addressing these concerns. Wills said, “All parties have a duty to make sure that they are included, nobody can hide under the cover of technicalities to say that a fact that is reality will not be captured. “We have to look at it and address it one way or the other even if it means paying another visit, another JIV to expand the scope, we cannot leave those people outside the net of justice,” Wills said. However, Mr Precious Okoloba, Head of Media Relations in SPDC said the oil firm stands by the JIV report that allegedly excluded vast parts of impacted areas.